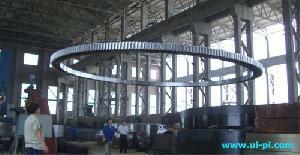 Large Diameter Slewing Ring Bearing For Harbor Crane. which is incorporateed a row of rollers and a row of balls into the same unit. This combination of rolling elements is designed to handle small eccentricities at relatively high axial loads. No-wooden case packaging suitable for ocean transportation. Or acoording to customer's requirement. Slewing bearings� material is available in Alloy steel (AISI4140 /GB42CrMo /DIN42CrMo4 /BS708A42) , carbon steel (AISI1045 /GB45 /DINCK45 /BS060A42, AISI1053 /GB50Mn /DIN50Mn5 /BS080M50). Company Name: Universal Industrial Products Inc.